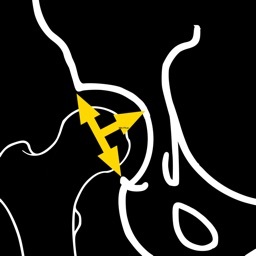 Hip dysplasia leads to premature osteoarthritis of the hip and accounts for many of total hip replacements in patients. The early diagnosis is extremely important and is based mainly on the radiological findings. 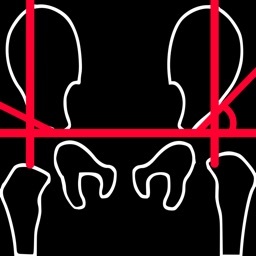 In a radiographs correctly performed measurements of Indexes like the Acetabular Index (AI), the Center-Edge (CE), the Acetabular Depth-Width Ratio (ADR), the femoral head extrusion index or Reimer Index (RI), the Congruity Index (CI), the Sharp’s angle (SA), Tonnis grade of dislocation (TG), the Acetabular Index of the Weight-Bearing Zone (AIW) or Horizontal Toit externe angle (HTE), and Congruence Index (CG) are important for an the orthopaedic surgeon who wants objectively to asses and monitor optimally on standard radiographs the hips. 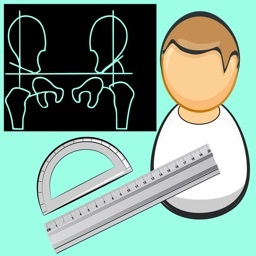 These measurements usually performed in one X-ray by the traditional way which is time-consuming and cumbersome. 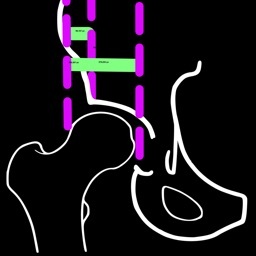 We offer this new app, in which simply by marking five points at each hip you measure in an instant, all these indexes. The app also compares the results with normal age, gender and side specific reference databases retrieved from the international literature. -Offers a very convenient way to determine the most accurate possibly way nine Indexes of hip dysplasia at once. 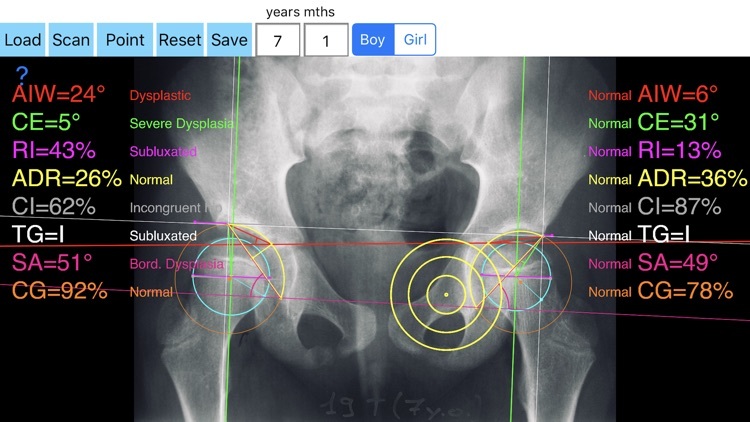 By inserting the gender the age and marking five points at the same X-ray, at each hip, the App calculates the nine above mentioned indexes (AI, AIWB, CE, RI, ADR ,CI, SA,TG, CG) without to have to repeat each measurement separately. You measure all radiographic Indexes in one picture. 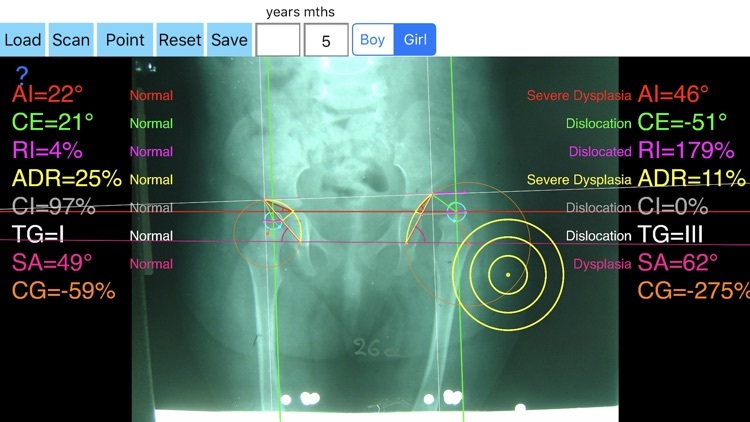 Gender age and side-specific normal reference databases are used and in cases where values are out of normal ranges, the hips are categorized according the measured Index normal categorisation. -Save the planned images, the measured values and results compared by normal reference databases, for later review or consultation. -The app also is independent from errors produced by image inclination. Especially developed module allows the user to measure accurately without to worry about the tilting of the picture or the X-ray. -Measured data are exported as txt file, ready to print or to input as cells to excel for research. All information received from the software output must be clinically reviewed regarding its plausibility before patient treatment! 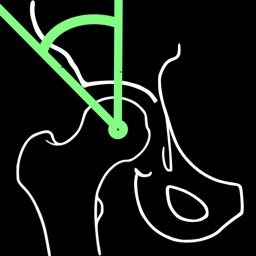 Hip dysplasia App indicated for assisting healthcare professionals. Clinical judgment and experience are required to properly use the software. The software is not for primary image interpretation. In a busy everyday practice, measuring in X-rays in clinical settings it is time consuming and cumbersome. Accessory instruments like protractors, goniometers, well sharp pencils, rulers or even transparent papers must be available. In case you have a packs system usually you don’t have the reference data. 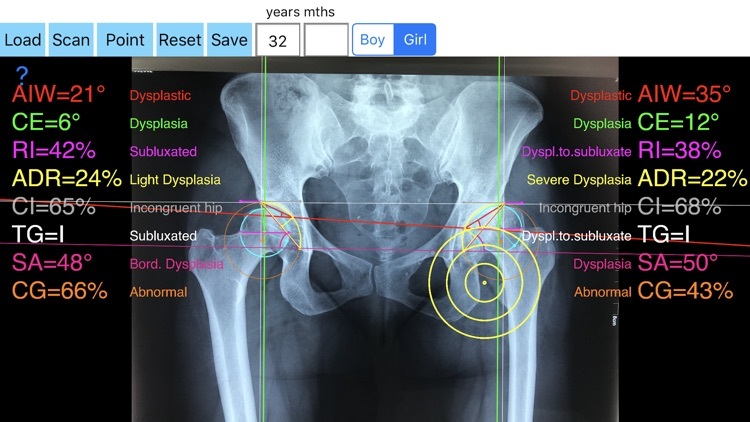 The app offers a very convenient and also accurate way to perform most common radiographic measurements for hip dysplasia, in a blink of an eye in front of your screen. 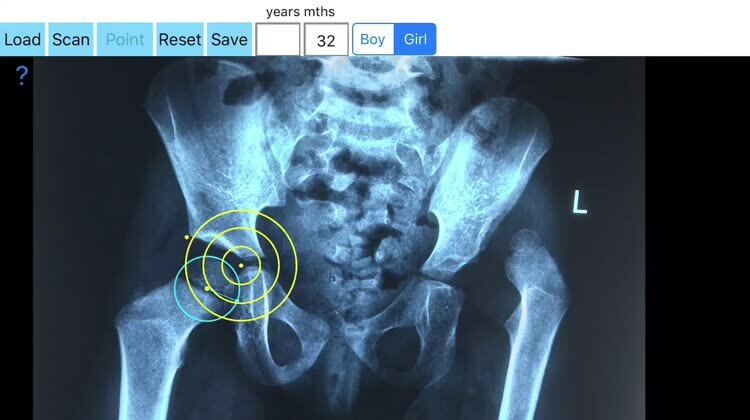 The build in feature of the app, allows results to be compared and categorized according to gender, age and side-specific normal reference databases and help decide what could be considered normal or pathologic. 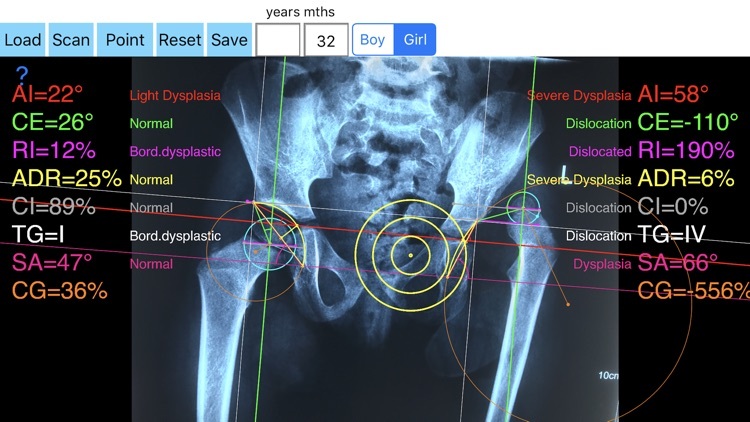 The app is not a simple goniometer, is an enhanced product which helps to monitor objectively the course of the treatment and evaluate optimally the remodeling of the hip. This App is particular useful especially in clinical settings without losing time. Please see tutorial videos at the developer’s web site.